DAYTONA BEACH, Fla. (AP) Barney Visser was a few weeks removed from a heart attack when the Furniture Row Racing team he founded was running for a NASCAR championship with Martin Truex Jr. Stuck in a bed, the excitement got Visser’s blood pumping. The 69-year-old Visser calmed down as Truex clinched the first Cup title for himself and FRR at Homestead-Miami Speedway. Visser missed the championship bash – though the trade might have been worth it. ”If somebody asks you, `We’ll give you a championship but you can’t be there, would you take it?’ I guess I would,” Visser said. Visser returned to a track Thursday for the first time since last season, and said he feels as healthy as he has in years. ”There’s nothing like getting new arteries,” he said. He was stir-crazy in the months since being hospitalized and only recently was cleared to participate in some mild celebrations. There was a dinner with Truex, crew chief Cole Pearn and FRR President Joe Garone. Visser returned to the shop in Denver for the first time Wednesday. That was about it. Visser said the heart attack caught him by surprise. He had a stent put in about six years ago to help treat a 96-percent blockage of his coronary arteries. He said his cholesterol level was so low at the time that his doctors were convinced Visser would not build up plaque in the arteries. But it did – Visser had a 99-percent blockage in one artery while the one that was stented was 70-percent blocked. But on Nov. 4, Visser woke up with numbness in his left arm. He couldn’t shake it off, refused to ignore the symptoms and went straight to the hospital for an angiogram, a decision that may have saved his life. Visser caught up with the team at Daytona and was clearly in good spirits. 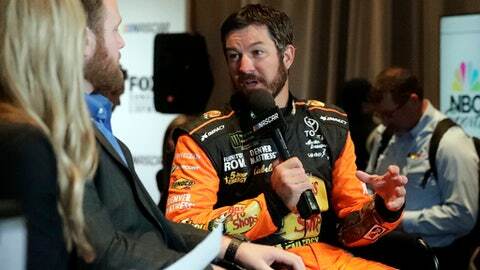 There was still some business for FRR: The team only fields Truex and the No. 78 Toyota this season after running a two-car operation last year.